High above New York, Baxter-Fly buzzes around in search of his prey. On a rooftop, he spots the Teenage Mutant Ninja Turtles playing baseball with Casey Jones. Swooping down, Baxter-Fly captures Casey in a ninja-net he’d stolen from the Turtles at some point. Baxter-Fly teases the Turtles and then flies off with the furious, but completely helpless, Casey. Rallying his brothers, Leonardo draws his swords and heads after the evil mutant. Later, in the Shredder’s secret laboratory, Baxter-Fly finishes strapping Casey to an operating table. Gloating, Shredder explains that Casey will be the first in a new race of mutants created to serve him. Shredder then orders Baxter to bring the octopus so that he can combine it with Casey. Suddenly, the Turtles come crashing through a window (“secret” lab, indeed) and order Shredder to surrender. But the villain isn’t ready to give in, just yet. Pressing a button, he summons one of his evil allies. The Turtles are suddenly strafed from above by the laser-wielding Wingnut. Thinking fast, Donatello hurls his bo staff and knocks out Wingnut’s starboard jet-engine, sending the bat-man spiraling out of control. Baxter-Fly swoops in and saves Wingnut and the pair escape into the sky. Meanwhile, Raphael cuts Casey loose from the operating table and reunites him with his golf-bag full of gear. Shredder decides to resort to his trump card and escapes into a secret room. The wall then crumbles as he comes stomping through, piloting a humongous Mouser robot! Shredder wastes no time in attacking, leaving the Turtles and Casey at a disadvantage, as none of their weapons can so much as dent the giant Mouser. Outside, Man Ray is flying high above the city. He’s finally tracked the Shredder down and is ready to deliver some justice. Smashing through the roof, Man Ray lands outside the cockpit of the Mouser and tells Shredder he’s going to pay for kidnapping that poor octopus. At Raph’s behest, Casey tosses Man Ray a can of red paint and Man Ray pours it over the viewscreen of the cockpit. Unable to steer, Shredder sends the Mouser stumbling through the wall of his warehouse hideout and off a conveniently located pier, into the river where it promptly sinks. Joining together for a group pose, Leo hopes they’ve seen the last of the Shredder for a while. Man Ray, though, has worked up an appetite. Michaelangelo has the remedy: Pizza Time! *Disregarding the Japanese manga adaptations of the Fred Wolf cartoon series, this is the only comic that Baxter-Fly has ever appeared in. 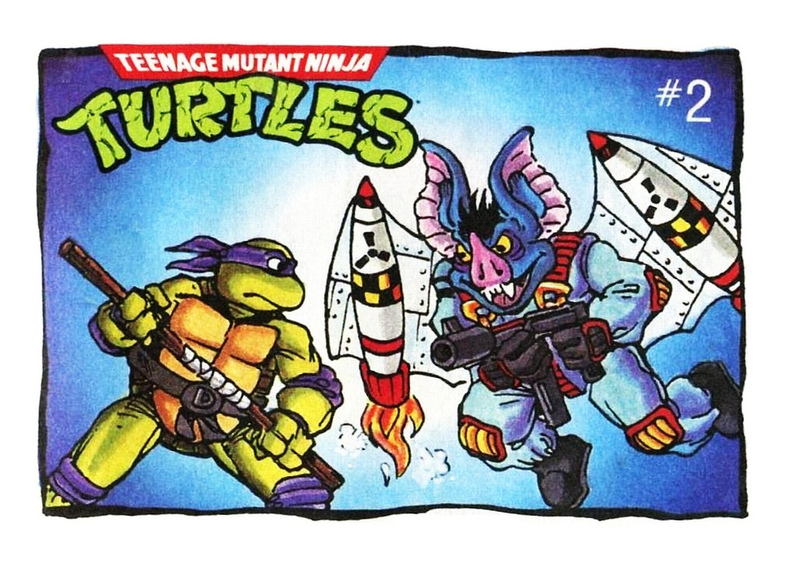 *These comics were available several months before the release of TMNT Adventures #5 and TMNT Adventures #8, thus making them the first appearances for Man Ray and Wingnut. *With the characters being so early in development, this might explain why they're so... weird, what with Wingnut working as Shredder's henchman and Man Ray flying through the air like Superman. *According to Blast from the Past #216, Laird suggested these comics may have been inked by Ryan Brown and colored by Steve Lavigne, though he isn’t completely sure. Lavigne confirmed on Facebook that he colored the pages, though Brown's inking is still unconfirmed. *With one proof of purchase and $0.50 cents for shipping and handling, one could order all three comics from Ralston Purina at once. That offer expired July 31, 1990. God, Ninja Turtles Cereal was awesome. Something about the combination of Chex (excuse me, “ninja nets”) and marshmallows was just perfect. In retrospect, it kinda worked better when it was rebranded as Spider-Man Cereal and the “ninja nets” became more reasonable “spider webs”, but whatever. That cereal was still delicious. Alas, I never collected the comics in this promotion. I may have been too young to care and threw them away, but I recall knowing about them at the time. We’re talking twenty years ago, people. I was five. 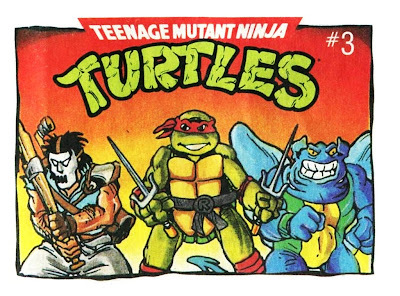 However, thanks to TMNT fan Wildiverse of The Technodrome Forums, I was able to collect scans of all three volumes! Drawn by Peter Laird, these mini-comics are some pretty fun and kooky stuff. They employ a number of supporting characters in some rather bizarre ways, but all to my approval. 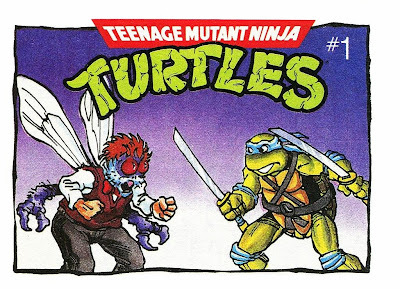 The Archie TMNT Adventures comic wrote Baxter Stockman out of the series before he had a chance to turn into Baxter-Fly, so seeing him appear in that form in a comic, even a cereal box prize-comic, was really cool. And Laird deserves some cred for working the “ninja net” cereal piece into the actual story. While Man Ray flying seemed a bit… off, I thought Laird’s redesign of Wingnut looked really good. I was never a fan of his Batman-inspired getup and found this baggy flight-suit design far preferable. Screwloose is nowhere to be seen and, so far as I know, this is the only time he’s ever been shown working for the Shredder, but Wingnut’s kind of a blank slate, anyway. In the cartoon, he was a world-conquering alien invader that brainwashed children with a phony military school. In the Archie comic, he was a handicapped refugee of a dead planet who liked to throw rocks at windows. And in the Konami TMNT Tournament Fighters game, he was big into rock music. Wingnut’s whatever you want him to be, I guess. Anyway, of all the pack-in and giveaway comics the Turtles have accumulated over the years, these are some of the most fondly remembered because they were the easiest to get and the most widely distributed. Oddly, not a lot of kids kept them and so it took a few years to track down all three online. At any rate, they’re pretty neat. Hm, no mention of Casey Jones in your comments section? Him interacting with Archie characters is a first. Michelangelo tends to get the shaft when it comes to being featured on covers. Every turtle but him got featured on these covers. And he also got left out of the Tournament Fighters covers! WOW! I never knew these existed until just now. I was looking up information in Wingnut and found this post. 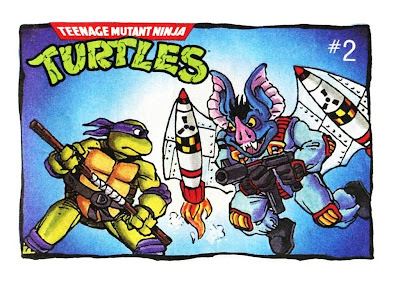 Hope you don't mind, I'm linking to this post (and used an image, with credit) in my current blog about the TMNT vintage Playmates wingnut toy, I like to show the different contrasting art style etc that Wingnut was depicted in from this era. It's mostly Transformers stuff, but some TMNT toy stuff lately, which will eventualyl migrate to my other 80's themed blog. Thanks for such an awesome blog, I've dabbled here and there when looking up odd references before, but mostly for personal interest and enjoyment.